Passionately formulated using only the finest ingredients. Fast Drying, Long Lasting, Smooth Application. 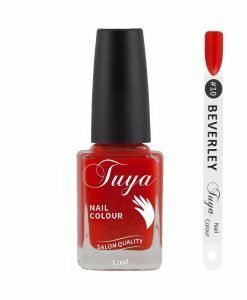 Part of The Tuya Collection, the Tuya Nail Polish is an incredible set to further compliment the Tuya Colour Cosmetics makeup collection. 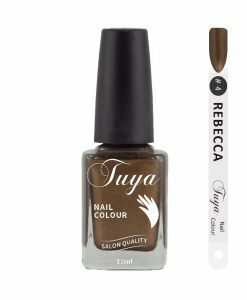 Tuya has taken a new direction to bring you an array of amazing Nail Colours, that will compliment the Tuya Mineral Make Up Range. We are excited to say Tuya nail colours are “7 Free” and Vegan. Being conscious of the need to be free of nasties is slowly making headway. Some companies are now listed as “3 Free’, meaning they are steering clear of the 3 particularly dangerous ingredients. Dibutyl Phthalate DBP, Formaldehyde and Toluene. Tuya has also gone that road but removed another 4, which makes us proudly “7 Free”. Alongside our Vibrant – Natural colours we have a Base Primer, Final Finish, Cuticle Care and a Soy Nail Colour Remover all of which are “7Free” – Vegan and Not Tested on Animals. Chip Resistant – Smooth Application. Fast Drying – Long Lasting – Nail Friendly. “7 Free” Formulation – No Testing on Animals. Fumic Acid, Citric Acid, Pthalic Anhydride, Trimellitic Antiydride, Gloycob Copolymer & Mica. Available on various payment options such as Afterpay, Oxipay and Zippay as well as Paypal.